DESCRIPTION: This bridge, also known as the Interprovincial Bridge, spans the Ottawa River between Ottawa, Ontario and Hull, Quebec. It was designed and constructed by Canadian engineers at a time when most major works in Canada were designed and built by non-Canadian firms and it provides valuable examples of the changes that were taking place in the use of steel and concrete by the engineers of the time. 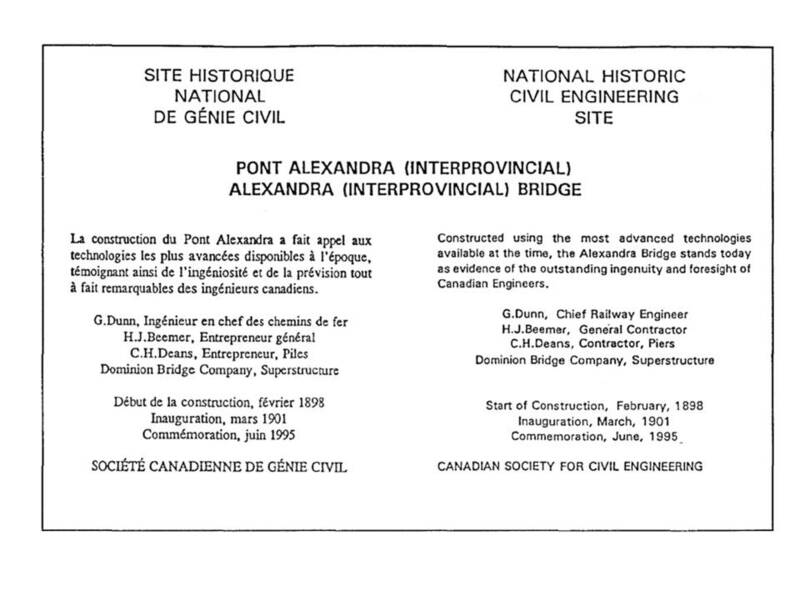 ENGINEERS: G. C. Dunn, Chief Engineer, Interprovincial Bridge Company. G. H. Duggan, Chief Engineer, The Dominion Bridge Company. F. P. Shearwood, Assistant, The Dominion Bridge Company. BACKGROUND: The prime movers for the construction of this bridge were two local railway companies, later part of the Canadian Pacific Railway, that established the Interprovincial Bridge Company, with H.J. Beemer, of Montreal, as its President. The necessary legislation and financing was finally obtained in 1898. 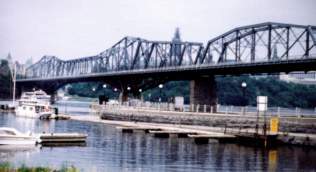 The CPR retained ownership of the bridge until it was taken over by the National Capital Commission in 1970: it is now owned by Public Works Canada. The Interprovincial Bridge Company awarded the contract for the design and erection of the steel superstructure to the fledgling Dominion Bridge Company. The company started work on the substructure in 1898 and steel erection, started in December 1899, was completed nine months later. The first locomotive crossed the bridge on December 12, 1900, although the official opening did not take place until April 22, 1901. At the time of it’s opening it was the fourth longest cantilever (pin-connected truss type) span in the world, with a clear span of 320 m (1049ft 9in.). It had a total length, including approach spans and trestle, of 818m. (2685ft.). All steel used was mild steel and the piers were built of concrete with a masonary facing built above the water line. The Summer and Winter water levels of the river were critical factors in the bridge construction. Excavation for the main piers was hindered by the presence of up to 7.6m (25ft.) of sawdust, wood slabs and logs from the lumber mills upstream. Timber cribs were founded on the bedrock and concrete was placed in them, underwater, by kibbles” (bottom opening steel buckets)’,,, supported by four scows anchored in the river, was constructed. The original railway track and two pedestrian footpaths ran between the trusses, with cantilevered decks for road and streetcar traffic.